The #FITIN15 plan features 15 brand NEW, FREE, 15-minute-or-less workouts designed to help you start an exercise program or ease back into a routine if it’s been awhile since your last workout. And, for those of you who have been exercising regularly and are looking for more of a challenge, we’ve made it super easy for you to take this to the next level. Start with the #FITIN15 workout of the day and then click on the related playlist link in the YouTube page video description to keep working out with similar style routines — the links will start on the exact workout I recommend doing next! We’ll also be offering free BONUS workouts that you can do in between #FITIN15 days, only if you feel up for the extra sessions (again, beginners, we suggest sticking with just the #FITIN15 plan to start off safely and continue strong). You might also want to pair the plan with our brand new DVD set, the “Walk On: 21 Day Weight Loss Plan” which is the perfect compliment to the #FITIN15 program. We’ll include suggestions as to where to fit in those walking based routines during the program too. All you have to do is click on the workout assigned for the day to load the video, complete the workout and then check in with us on YouTube! “Check in” with your team by leaving us a comment on the video page to let us know you’ve completed the workout and let us know how it went for you. You will need to have an active Google+ account in order to comment on YouTube. And please make sure your Google+ Profile is set to “public” in order for us to reply to your comments. STEP #1: SUBSCRIBE TO OUR YOUTUBE CHANNEL (JUST CLICK HERE!) You don’t want to miss a single new episode! STEP #2: COMPLETE THE WORKOUT OF THE DAY. Each #FITIN15 workout is 15-minutes-or-less, so they are super easy to squeeze in and avoid exercise overwhelm or extreme soreness, especially if you are new to exercise. For beginner exercisers, we recommend simply sticking with our #FITIN15 workouts to start building your exercise habit and to avoid burning out too quickly. STEP #3: CHECK IN WITH US ON YOUTUBE. One of the amazing things about our channel is the great community we have here on JESSICASMITHTV! By becoming a subscriber you’ll join a team of encouraging, like-minded individuals from across the globe that will all be doing the same workouts with you in real time. After you’ve completed the workout assigned for the day make sure to “check in” with your team by leaving a comment on the video page to let us know you’ve completed it and let us know how it went! Peanut and I will be reading each and every one of your check-ins, so be sure to post after each workout! While we can’t respond to every single comment, we will be cheering all of you on and answering questions during the entire program. Take a 10-30 minute walk or try the “Walk On 21: Cardio Core” walk. Take a 10-30 minute walk or try the “Walk On 21: Low Impact HIIT” walk. Take a 10-30 minute walk or try the “Walk On 21: Tred and Shred” walk. BONUS OPTION: Take a 10-30 minute walk or try the “Walk On: Stride, Stretch and Relax” walk. *Remember, if you want to keep working out look for the link in the video description on the YouTube page. You’ll see “WANT TO KEEP GOING? CLICK HERE” along with the link to the workout I recommend trying next (it’s a full playlist so you can keep going as long as you want, but be sure to pace yourself!). Take a 15-30 minute walk or try the “Walk On 21: Cardio Core” walk (or one of our 15-Minute Walk On: Fast Fat Blasts! ); or try the AM: Energizing Flow from our new “Yoga Stretch for Beginners and Beyond” DVD. Enjoy an active rest day and/or stretch with our #FITIN15 Chair Yoga video. BONUS OPTION: Take a 15-30 minute walk or try the “Walk On: Stride, Stretch and Relax” walk, or the PM: Relaxing Flow from our new “Yoga Stretch for Beginners and Beyond” DVD. Enjoy an active rest day and/or try this Better Posture Workout. Enjoy an active rest day + CELEBRATE completing this challenge! I really enjoy your workouts! I jumped through many of them doing whatever I felt like in the past, there are soooo many options. But I’ve always had trouble staying motivated to workout daily. This is the first time I’m trying a challenge. Yesterday I gave blood and was told no exercise that day. So, I got caught up by doing week one days two and three tonight. Even for someone as out of shape as I am, I was able to push through them. Wish me luck, as I do everyone else! Going to keep posting because I’m hoping that will help me stay motivated. Thank you Jessica Smith! This workout plan is awesome! Started Week 2 today! I love the variety as I get bored easily with the same thing. After the first week, I feel better and stronger already. I will do this plan all over again with heavier weights! Thank you for this!! I have used this calendar before, and I loved it. I’m a teacher, and plan on using this calendar with the videos provided with some of my teacher friends this school year. We used your walking videos last year and we loved it because it gave us an opportunity to get together in a fun an healthy way that really bonded us as friends and professionals. Thank you so much for making this available. I was wondering, after the calendar is finished, we don’t want to stop, so what would you suggest going forward? Repeat the calendar. Do you ever have plans to further this calendar. It really helps us busy teachers who are responsible for things after the school bell rings. I really wish you would have a fit in 15 stage two. Sometimes 30 minutes a day is too much to fit into our days. Hi Jessica! I’m from Italy and I fell in love with your mini workout! Now I’ve just started Fit in 15. Tomorrow I will begin week 2 amd I am really satisfied with it! Your workouts are very great, never boring and for me full of positive results! love your workout videos. However, I find them very challenging. i have been doing leslie sansone 3 mile walk but i found yours more challenging hence, gave them a try. But i am not able to keep up the pace probably because of lack of stamina and am not able to do few of the steps too. i am also trying to eat clean and have a pear shaped body. No matter which workout I try, it always effects my upper body which makes the shape look even more pathetic so I just quit. What do you suggest? Love that –thanks for working out with us ladies 🙂 Keep up the great work you are doing taking care of your body and your health and we’ll see you for another session soon! I know I am a little bit behind but I just started the 5 weeks program a few weeks ago, I am on week 4 right now. Really love this program and Jessica’s videos in general, so much better than every other thing I have tried before. I just love the variety choices in each video every day is a different area of the body, it’s not boring or repetitive, and Jessica walks you through each move for beginner to advance options. I just wanted to ask everyone , what do you do when you are done with the 5 weeks program ? is there another program I can follow ? I know there is hundreds of videos on her channel but I want to make sure I dont focus on only few areas, I like the variety there is in this program where you work on every part of your body. I’d like that have something similar to follow after this. Congrats Wendy! You should join us for our Walk STRONG Challenge next 🙂 Here’s more information on what is included. I loved this program. I followed the 5 weeks with the Walk on 21 DVDs. What is so great about this program is that there is a lot of variety so I never got bored and that there are plenty of modifications presented so I could always choose the right one for me (from the total beginner options to the more advanced ones). Thank you so much for making that program available. Now I’m going to follow the challenge with the Walk on 30 day plan DVDs. Thanks so much, glad you enjoyed it! We’re excited to continue on with you with our new 30 day program too 🙂 Feel free to check in with us here on our website as you go through the plan and let us know how it’s going! Thanks for moving with us! with all the smoke in the air in our area, had to go back down to the 15-minute workouts as I have asthma, and smoke and exercise don’t work well for me. Still a good workout. Thank you, Jessica! i am 16 and i’m 170 pounds .i’d would like to know which one should i start with .i used to do the apple shape body workout but haven’t completed yet. should i complete it or start these challenge ? I just completed the Day 1: Jump Start Cardio! Great start to my day! Fun and easy workout that kept my heart rate going! Thanks for the video and I look forward to continuing the #FITIN15 Workout Plan! Just did day 1 of fitn15. Thank you Jessica…see you tomorrow! I’m a beginner, I’d like to start working out and your plan seems to be exactly what I need for a place to start. You suggest to do only the FITIN15 workouts, so do I have to do only those, or can i add the ones from your DVD, which I got too, on the other days? Feel free to add in the DVDs as well whenever you feel up to it 🙂 Please keep us posted on your progress and how things are going for you. Welcome to our community! 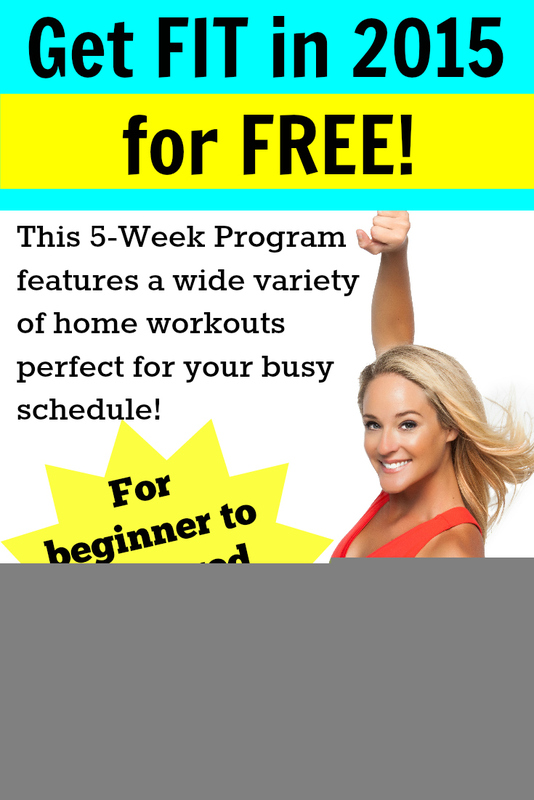 I am on week 5 of your Fit in 15 program and am loving the workouts and your style. What do you recommend doing once this program is complete? I’m starting to see some physical results and really want to keep going!!! Hi Jessica! Just started the #FITIN15 challenge today! Stumbled upon your YouTube channel a week or two and am loving the workouts! Looking forward to loosing the rest of my post baby weight before my little one’s first birthday in a few months. Thanks for your great work! Awesome, welcome to our community and the challenge! Hey! I just finished day #1 (way late, but glad I could still join) and was wondering how many people did the entire month of working out? I feel like their successes would encourage me to take the time and complete it too…is there a page where people said how they felt after completing the challenge? I’ve been a subscriber for a while now, and I love that you have such great (fun!) workouts available for free; I want to buy a shirt to support you but I’m currently serving as a Peace Corps Volunteer in Thailand and money is tight…and the shipping is a lot of money! Smile, I’ve asked for one for my birthday, though. I love that I’ll be able to continue this series (if I persevere!) even in the rainy season, because I have space in my Thai gingerbread house, and flooding and heavy rains are just around the corner! Thanks again, and wish me luck (‘chok dii’, in Thai) for day #2 and the rest of the challenge! Hi Jessica! I just did the first day of #Fitin15 and I love it! I’m just wondering if there’s a printable version of this calendar? I love checking things off and tracking my progress that way 🙂 Thanks! I’ve been doing your short “easy on the knees” workout on my lunch break at work. Signed up for you YouTube channel yesterday and started the Fitin15 this morning. The level is great and I really appreciate the short sessions. Now I must hit the showers and head out. Thanks Jessica! A friend recommended your barre-style workouts in September and I was instantly in love with the style of your videos and the way each exercise builds up. The movements are challenging, but also enjoyable! The instruction also helps me to focus on the correct muscle group to really get the most out of each. The choices in duration and style have kept me more consistently on track with my goals than any other workout plan I’ve tried. Loving #FITIN15! Thank you!! This is for both men and women – we hope you will try the workouts! Hi Ms. Jessica. Is it ok to do the FITIN15 if I undergone a CS operation? But that was 3yrs ago. I am very interested in your program. I really wanted to get back in shape again. My arms, thigh and stomach are not in good shaped (pregnancy fats). Thanks. I started this workout a few days after you began. I was on a roll doing every exercise, minus the walking since I don’t have a treadmill and the weather has been disgusting all day, then I got sick and the medicine I was taking had me off exercise for 2 weeks. Once those 2 weeks were over I started back from the beginning. I’m on day 32 now and I’ve lost 7 pounds! Planning on starting over and not doing the beginner moves and actually walking/running. Your amazing! Most exercise routines I get bored easily, but you make it enjoyable and fun! Hi Jessica, I’ve done several of your workouts and bought several of your DVD’s and love them all. I’m not sure I understand how the FITIN15 works. It says to start with the FITIN15 workout of the day but there is only a FITIN15 workout listed every other day not every day. Can you please explain for me? I know this isn’t difficult but for some reason I’m not getting it. Thanks Jessica! Hi Carrie! To follow along simply scroll down this page to view the weekly schedule for the #FITIN15 plan. We’ve listed each recommended workout daily for the 5 week rotation. You can follow along with the YouTube options and/or add in our newest DVDs as you see fit to make the program work for you. Hope that helps! love these workouts. The standing abs buns and thighs really got me. Loved it! I also purchased the 15 minute fat blasting walks dvd and LOVE it too. Who doesn’t have 15 minutes??? I’m starting over from a 2 year forced stop. Day 1 cardio wasn’t that bad for me. I did really well with it. I thank you for giving me options to ramp it up or keep it low impact and i could mix it up. Thanks for this great program that I think I can finish. I’m so happy this work up is fun and really work, thanks Jessica for that. Jessica–your new 15 minute videos are totally awesome! On snow days, I pick out 3 or 4 to do and they’re all different and all really great workouts! Can’t wait for the new ones this week. Thanks for all of your hard work on them! i’ve just discover the programme and i’m starting tomorrow morning the exercises. Will the 15min DVD set be available on kindle fire download? I got a late start since I started my year being sick. Now I am feeling great and really enjoying this challenge, which doesn’t feel like a challenge at all. Thanks for putting this together!! I have been working out everyday and I am looking forward to them. It is fun to workout with you and Peanut. Keep up the great work!! I am on Day 10 and I am loving it!! I have very bad runner’s knees and am finally allowed to start exercising again. 15 mins is perfect for me to start back into a routine again – but your bonus videos look awesome and it’s hard for me to not jump into to them. After I am done this 5 week program will I be able to do the program again? Possibly use some of the more advance moves and some of the bonus videos? I want to ask you about beginners. I have multiple sclerosis. But I want to keep moving and not stiffen up. I have lower legs issues, what do you think I should do to start off? most positive fitness coach ever ! i hope I’ll complete this challenge. Just started today. Better late than never. Looking forward to it. Starting late, but so thankful I have. In my mid-thirties, recovering from breast cancer treatment and processing new hypothyroid diagnosis. Fit and healthy before the two years of surgery and chemotherapy, now wanting so much that fitness again. This program is my new best friend. THANK YOU, JESSICA! Day six done. I did the Best beginner workout. Thank you Jessica! 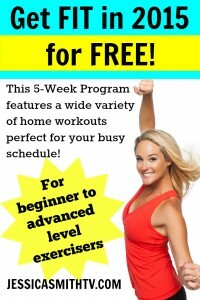 The fitin15 program is just what I needed! Awesome workouts! Started late, Day 1 DONE! Felt great – thanks so much. this is amazing! I have been a very active runner for years, but due to server knee problems, I haven’t been able to do much lately. now with the okay to start easing back into working out again, this was the perfect start. I can’t wait til the next workout!! Thanks Jess! !